Passed away November 14, 2018 at the age of 55 at his residence in Pendleton, Oregon. Jerry was born August 12, 1963, the son of Claire (Hansen) and James Steele, residents of Vashon Island. In 1966, Gerald (Jerry) Hansen became his stepfather. Jerry grew up on the Island and was part of the first district run self-contained Special Education class. He graduated with the class of 1982 from Vashon Island High School. The Wojciechowski’s were Jerry’s surrogate family whom he lived with while completing High School and visited whenever possible. During Jerry’s senior year he was employed by Vashon Thriftway as a box boy. While on the Island Jerry was active in VICTOR, where he was introduced to the world of the Special Olympics. A competitive athlete, he was a lifelong participant in the Special Olympics, earning several medals in many events. Jerry loved road cycling the most, competing with his sister Beth Britz and nephew Graeme Britz as his Unified Partners. After High School Jerry lived in the Seattle Tacoma area in supported living homes. Jerry was featured in a 9/29/1982 Seattle Times story about his role as a waiter at the Mint Restaurant in the Pike Place Market. Jerry was a hard worker breaking down barriers. Jerry worked many different jobs over the years and was frequently held up as an example of productivity and possibility for others. Jerry’s sister Beth Britz acted as his guardian and advocate during these years. Following the death of his mother, Claire Hansen in 2003, Jerry pursued his dream to become a cowboy. He moved to Hermiston, Oregon near his sister Sharon (Hansen) Tullis, where she took on the roll as guardian and advocate. He lived in Hermiston for five years working at Hales Restaurant. In true Jerry fashion, his off-work hours were spent helping local merchants by sweeping sidewalks, making friends and offering them business advice. 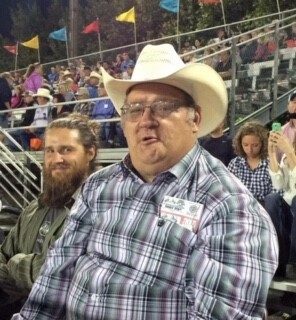 Jerry was active with the Hermiston Farm City Pro-Rodeo along with his brother-in-law Scott Tullis. He volunteered at work parties, mingled with and earned the admiration of the Cowboys while keeping the stock watered. He saved several errant steers that got stuck in water troughs. Jerry moved to Milton Freewater with his pair of miniature horses before moving to Pendleton in 2012. He worked at Wild Horse Resort and Casino from 2013- 2018 and loved his job and the people he worked with. He had the distinct ability to fold a fitted sheet, perfectly flat. In 2015 Jerry was featured on a giant billboard along the Hwy for “IWorkWeSuceed.org” promoting community jobs for people with intellectual and developmental disabilities. Jerry was also a member of Pendleton’s Main Street Cowboys. Always busy and helping others. Survived by his beloved cat, Sebastian; his sisters Sharon (Scott) Tullis of Hermiston, Oregon and Beth (Peach) Britz of Seatac, WA; Stepfather Jerry Hansen, Vashon Island; Two nephews Kyle Britz, Vashon and Graeme Britz, Seattle; Nieces, Erin (Greg) Britz, Yelm, Whitney (Chuey) Flores, Hermiston, Janelle (Tegra) Britz, Vashon; seven great nephews and nieces, Jayden, Amelya, Koda, Bella and Antonio all of Hermiston and McKenna and Dorian of Yelm. Jerry was preceded in death by his mother Claire Hansen and his niece Lindsay M. Britz. Any donations can be made in Jerry’s name to the Special Olympics. The family is planning a Celebration of Jerry’s life at 1:00pm, Saturday December 15th at the Vashon Island Funeral Home. Please come and share your Jerry stories.